This project is a collaboration between TUMCREATE and Berkeley, funded under the NRF seed grant scheme. Autonomous vehicles (AVs) are not going to replace ordinary cars overnight. Therefore, there will be a period during which the roads will be shared by AVs and human drivers. The effects of such a mixed traffic situation are hard to predict, and thus safety must be rigorously studied and ensured. Unfortunately, as a result of real-life tests, numerous accidents with AVs on the roads have already been reported, sadly also including one fatality. In order to achieve certainty for the safety properties of AVs, hundreds of millions of kilometres have to be driven and a large variety of known and yet-to-be-discovered dangerous test scenarios should be evaluated. This would further extend the risk exposure to real-life accidents. 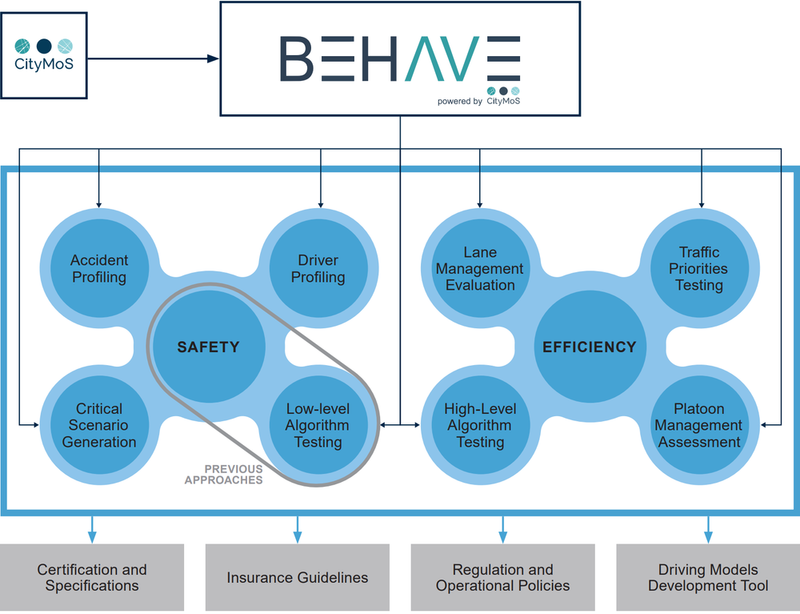 The BEHAVE project (Behaviour Evaluation of Human-driven and Autonomous VEhicles) aims to move as many of these dangerous test scenarios as possible from the real world to a virtual environment using simulation. This approach will drastically reduce the long time needed for real-life testing, as in a simulation environment millions of kilometres can be driven in a matter of days or even hours, avoiding risking lives on the road and saving energy at the same time. This will enable the timely identification of critical AV technology issues, ensuring safety and accelerating the adoption process. Methodologically, the BEHAVE project relies on detailed data-driven microscopic mobility behaviour models. The project is currently in its seed phase, which focuses on making the first step towards simulating mixed traffic (AVs and human-driven vehicles) scenarios. This will enable the detailed evaluation of the vehicle interactions in custom-designed scenarios. To make the process of driving behaviour model design easier and also to allow non-experts to get a feeling for the platform’s functionality, the BEHAVE model development tool allows users to interactively tweak the models’ logic and parameters, thus immediately observing the impacts their changes have on traffic conditions and safety levels in a simplistic scenario. We are developing extensions of existing car-following and lane-changing models, which allow for modelling the “human” part of the non-AV vehicles. We are exploring the addition of stochastic elements to incorporate unpredictable and even irrational human behaviour which includes factors like aggression, attention, and perception in the decision-making process both in the car-following and lane-changing models. Manipulating these stochastic elements will also allow for modelling changing driving behaviour because of external factors such as weather conditions, darkness, stress factors, and recklessness. By doing so, origins and effects of accidents due to these behaviours can be studied, capabilities that are missing in today frameworks. Our autonomous vehicle model allows for basic platoon formation, merging, and splitting. This enables the AVs to perform key manoeuvres unique to this class of vehicle and thus study the implications of AVs on traffic and the safety properties of platoons. The model has a hierarchical structure, which includes high-level planning, trajectory computation, and low-level control. The definition of distinct driver/vehicle populations that use different behaviour models enables the simulation of mixed traffic by, for example, allowing one of the populations to be governed by the autonomous vehicle behaviour model and the other one by the extended human-driven model. The user has control over weather conditions in the simulation and can change them dynamically while the simulation is running. Driver models will behave differently under different weather conditions. The main concern when using microscopic traffic simulation is the trustworthiness of the results. Standard models as defined in the literature are often insufficient to generate a realistic simulation environment. Therefore, based on real data, we are introducing a calibration algorithm to address these issues. In addition to the evaluation of various AV scenarios, the developed framework can be used to detect potentially unforeseen consequences of AV introduction. Such findings may include identifying driver types that are imposing severe restrictions on safe AV integration, road network settings that are manageable for humans but not for AVs, road infrastructure that is made obsolete by the presence of AVs, and accident triggers that only exist in mixed-traffic conditions. Our research will open the doors to the predictions of non-trivial emerging behaviours thus allowing researchers and policy makers to plan for a smooth introduction of autonomous vehicles into current transportation systems. This project is a basis for more far-reaching and deeper investigation of research questions arising from traffic safety, evaluation of different AV driving strategies, and even the optimization for AV-based ride sharing systems. Furthermore, the extension of this project may, instead of locally optimizing AV trajectories, develop global strategies, e.g., how AVs can be distributed onto different roads to reach a system optimum, not only with respect to travel times but possibly also in terms of charging strategies for electrical vehicles or even heat distribution and noise pollution.